"A shield with great strength. "A shield with great strength. Increases MP restoration speed by 50% when all MP is consumed." 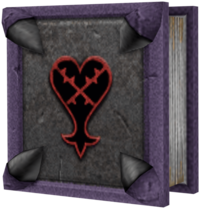 The Akashic Record is a shield that can be wielded by Goofy that appears in Kingdom Hearts II. 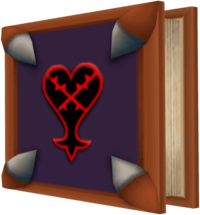 The Akashic Record is a square shield that is virtually identical to the books held by Bookmaster Heartless. The front and back covers have a brown border, while most of the rest of the book is dark purple. Each of the front cover's corners is decorated by a small, silver claw pointing inward. 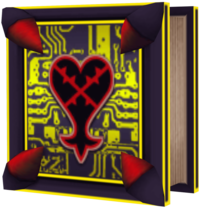 There is a Heartless emblem placed dead-center on the front cover. The pages of the book, visible on the sides, are tan. 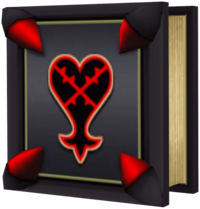 In Kingdom Hearts II Final Mix, the weapon is a palette swap of the Kingdom Hearts II version, but is otherwise identical. The once-brown border is now violet, the claws are black, and the rest of the cover grey. The pages of this version are silver. The Akashic Record+ is yet another palette swap of the shield. 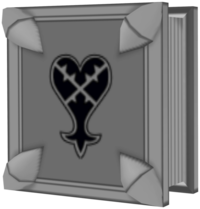 In this version, the border is black and the covers are dark grey, separated from the border by a thin, pale yellow outline. 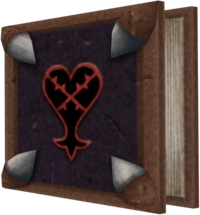 The claws are red and the pages are tan like in the original Kingdom Hearts II version. 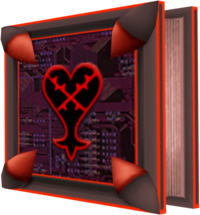 The Heartless emblem is mostly unchanged, except for a thin, white outline that is gains in this version. The Akashic Record's name is based on the eponymous theosophical concept. This page was last edited on 10 April 2019, at 14:50.